In the summer of 1988, my family went on a vacation to Los Angeles. As an eager 7-year-old movie fan whose internal clock was set to East Coast time, I woke up much too early and asked my mom and dad when we were going to Universal Studios. We had visited L.A. once before and Universal—the world-famous studio tour in particular—had easily been my favorite part of the trip. During this visit, our tour tram snaked up a hill, passing by the Chicken Ranch from The Best Little Whorehouse in Texas and a log cabin from The Great Outdoors. At the entrance to a street set against the hillside, wooden flats blocked the tram’s access to that location. Our tour guide announced on the PA system that behind those walls was a suburban neighborhood set and that a movie called The ‘Burbs, starring Tom Hanks, was filming there. Released in February of ’89, the Joe Dante comedy is a culmination of the movies and TV shows that made decades-long use of the studio’s archetypal suburban set. Much like the actual ‘burbs, Colonial Street has evolved with the American cultural landscape. Universal City was a working movie studio from day one when, in 1914, legendary movie mogul Carl Laemmle purchased 230 acres in the south San Fernando Valley along El Camino Real, which encompassed the Cahuenga Pass. The open expanse of land was ideal for one-reel Westerns—a staple of Universal at the time—Biblical epics, American Revolution reenactments, and Greek dramas including the first film shot on the lot, Damon and Pythias (1914). The studio had its grand opening on Monday, March 15, 1915 as the chief of the Universal City police handed Laemmle a golden key to his studio in front of a crowd of 10,000 people. There is no mention of Colonial Street and there wouldn’t be through the Universal films of the Great Depression—during which time Laemmle sold his stock in the studio—and World War II. Still, Colonial Street’s roots date back to the late 1920s when Laemmle produced the first feature length version of Uncle Tom’s Cabin (1927) based on Harriett Beecher Stowe’s controversial abolitionist novel. Based on the design of houses that were visited during location scouts, the Shelby mansion —named for the story’s Kentucky plantation owners—was built on the backlot at a cost of $62,000. It was not merely a false façade, but rather a practical set that included nine rooms so the filmmakers could shoot through windows and doors to give the impression that the entire film was shot on location. The mansion would make a number of appearances in Universal films before moving to a new location. The W.C. Fields comedy You Can’t Cheat an Honest Man (1939) cast it the Bel-Goodie residence in the affluent town of Passamaquoddy. 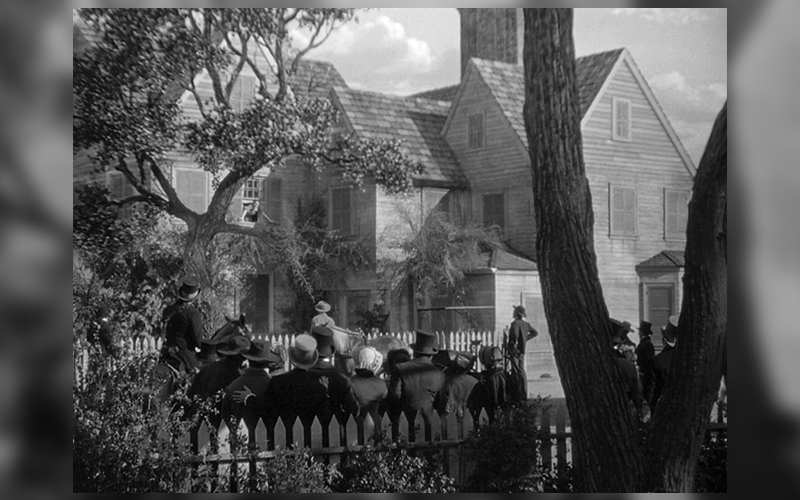 It was used as the House of Winslow in The Black Cat (1941) starring Bela Lugosi and Basil Rathbone. 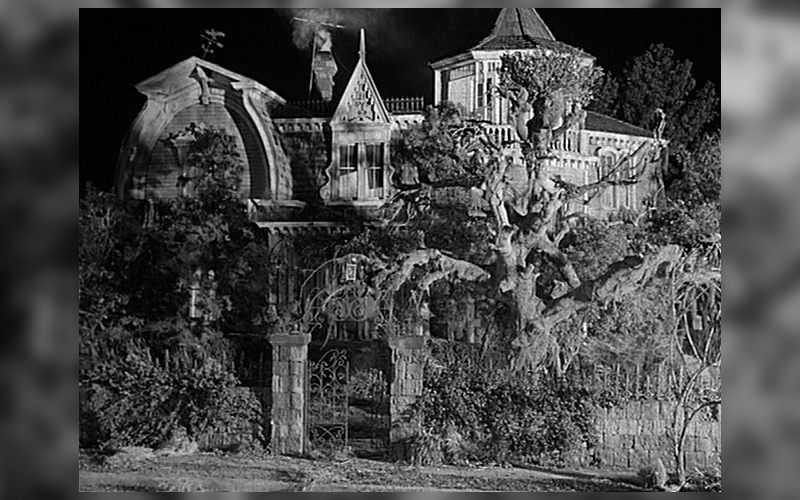 In 1943 it was used again as a spooky old mansion called Dark Oaks Plantation in Son of Dracula, starring Lon Chaney Jr. In 1950, the Shelby mansion, renamed the Colonial mansion, was moved (not for the last time) close to the L.A. River on the north side of the lot and became the first structure on the original Colonial Street. That same year it was seen as Chumley’s Rest Home in Harvey (1950) in which Jimmy Stewart, as Elwood P. Dowd, converses with his invisible rabbit friend. Later the mansion appeared as Stoningham Country Club in All That Heaven Allows (1956) and Brentwood Hall in Tammy and the Bachelor (1957). It even showed up in Disney’s first live-action comedy, The Shaggy Dog (1959). With the return of American GIs after WWII, the rise of the suburbs, the baby boom, and the popularity of television, the studio needed a quintessential Anytown, America set. In the 1950s, films and television shows about the people who were watching them were being created and, as a result, Colonial Street began to take shape. A church, a schoolhouse, and a small business district were constructed at the end of Colonial Street on what was dubbed Circle Drive. New houses were being built, but a few of the homes that eventually ended up on Colonial Street were relocated there after originally being constructed on sound stages in the 1940s. 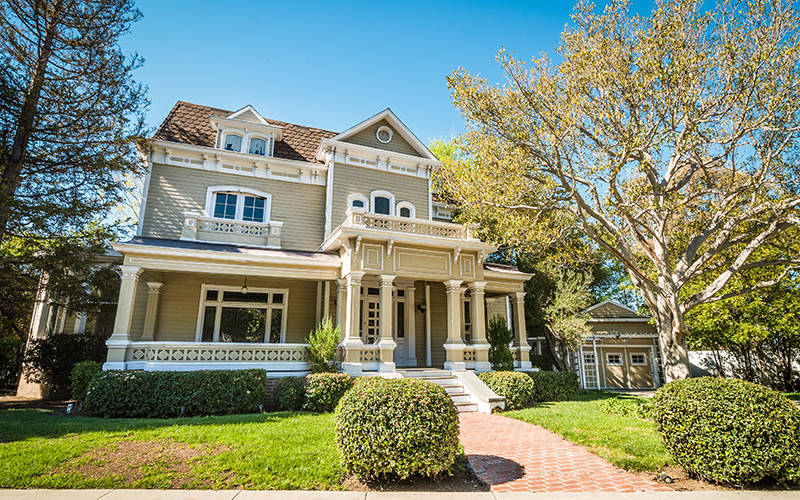 Two of the most famous Victorian-style homes that were moved to Colonial Street were built on soundstage 12 for the 1946 film So Goes My Love starring Don Ameche and Myrna Loy. The comedy is set in the late 1800s when Jane Budden (Loy) moves from Boston to Brooklyn looking to marry a man of wealth. She moves into the home of her cousin Garnet Allison and inadvertently meets struggling inventor Hiram Maxim (Ameche), who’s renting a room in the house next door. Interestingly the homes weren’t made famous because of So Goes My Love, the first time they were ever seen in a movie. The Allison home would later become the Dowd-Simmons residence in Harvey. The house has a couple of other claims to fame in its early years on Colonial Street including a kinship with Alfred Hitchcock. According to Stephen Rebello in his book, Alfred Hitchcock and the Making of Psycho, the iconic front tower of the Harvey house was cannibalized for use on the Psycho (1960) house. Pirtle says, “Our original set plans for the Psycho house that we have in the archives, the roof on the Psycho house is noted: it says, ‘moved from River Road,’ which is where the original Colonial Street was located.” Ironically, before being moved around the lot several times, the Psycho house originally stood on a hill near the spot of the Harvey house on present-day Colonial Street. 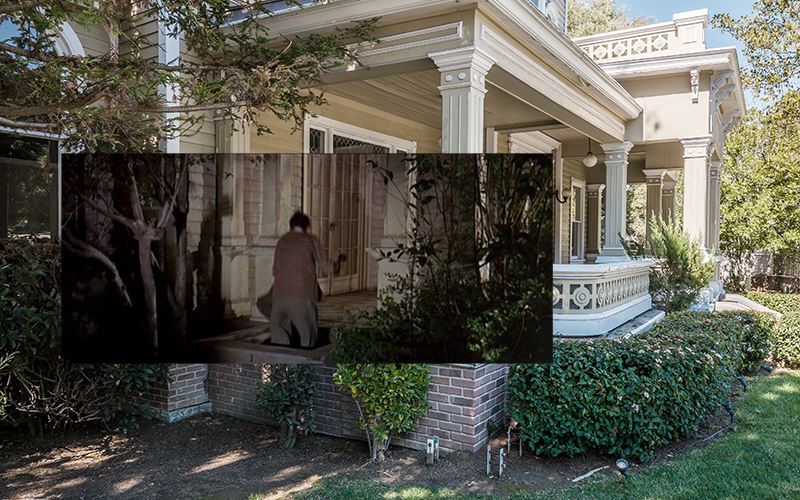 The Harvey house also famously appeared in the Don Knotts classic The Ghost and Mr. Chicken (1966) as the haunted Simmons mansion; the family name an apparent nod to Harvey. The original roof taken for the Psycho house appears back on the façade. Perhaps no other home on Colonial Street is known the world over as much as 1313 Mockingbird Lane. The home of Herman Munster and his family from The Munsters (1964-1966) was created from the bones of the house in which Ameche resided in So Goes My Love. The Munsters unaired color pilot episode shows the house largely unchanged behind some added dry brush, bare trees, and a gate. For the series premiere, however, the house was completely Munsterfied. 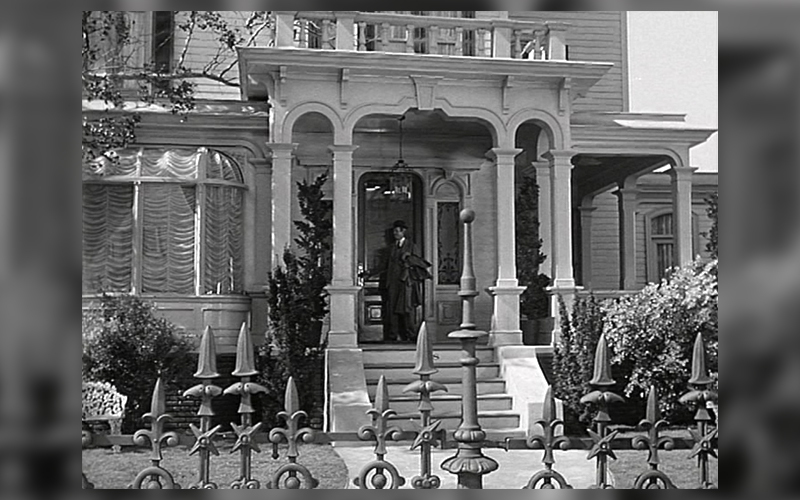 According to the book The Munsters: A Trip Down Mockingbird Lane by Stephen Cox, the studio spent much of the show’s initial budget dressing the front of the house, aging the location with gargoyles, twisted trees, distinctive Victorian rooftops, and a vampire bat weathervane. The home became the quintessential haunted house, a ghost of its former self from So Goes My Love. 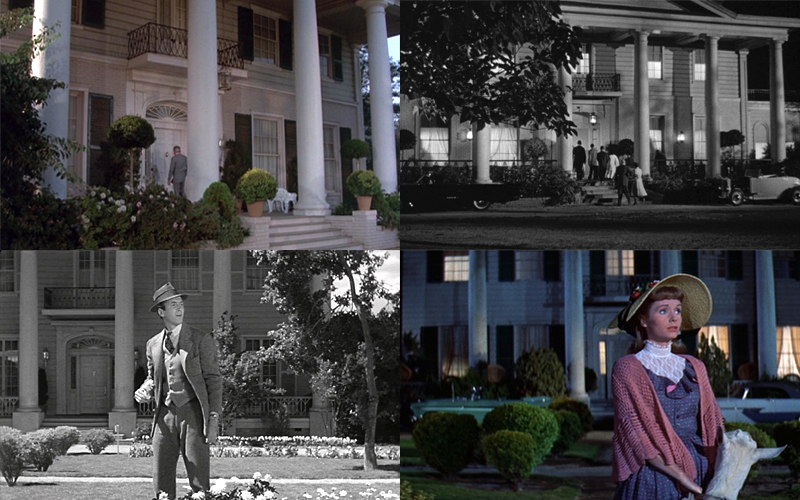 The back façade of the Keller house from All My Sons (1948), an adaptation of the post WWII Arthur Miller play, was also built on a stage and relocated to Colonial Street. Interestingly, the front exterior of the home from All My Sons is a real house in Santa Rosa, California. Three decades later, the Keller home was completely remodeled for a short-lived TV spin off of National Lampoon’s Animal House (1978) called Delta House. The set was remodeled to look like the Eugene, OR fraternity house used in the wildly successful John Landis film. Though much of the Lampoon creative staff including Harold Ramis, John Hughes, and Matty Simmons was involved with Delta House, the series lasted only 13 episodes due to constantly changing time slots and television’s sterilization of Animal House’s raunchy humor. 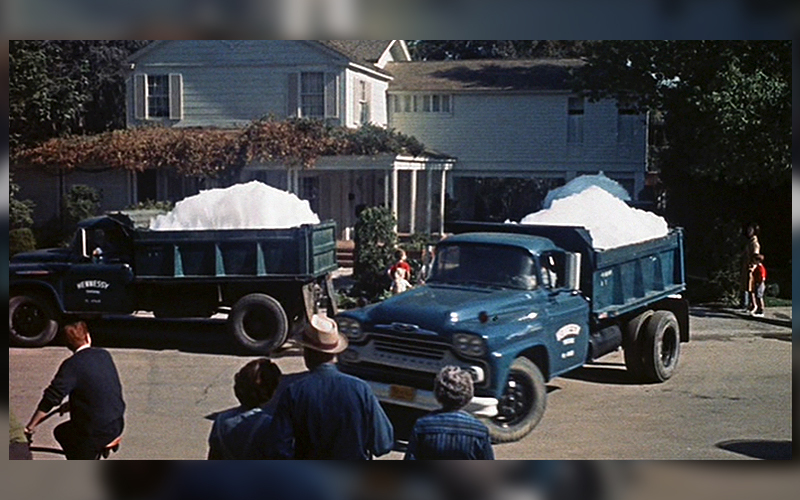 One of the first examples in which the grand scale of Colonial Street is seen on film is in the Ronald Reagan comedy Bedtime for Bonzo (1951), set in the college town of Sheridan. Reagan plays a psychology professor who, as part of an experiment to save his engagement to the dean’s daughter, attempts to teach morals to a chimpanzee. Shots of the neighborhood show that the houses line an L-shaped street, which provides depth and a reality to the exterior set. Reagan’s character lives in a home originally built for Nice Girl? (1941) starring Universal contract player Deanna Durbin. 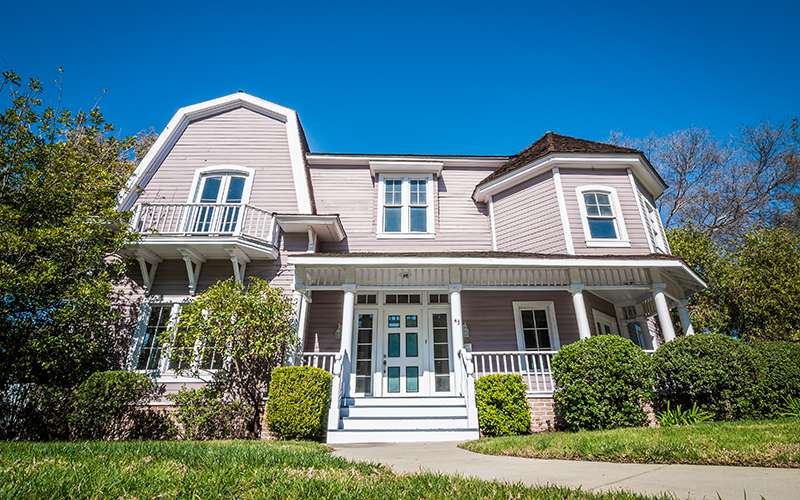 Known as the Dana home, its wraparound porch sets it apart from every other house on the block. After Nice Girl?, All I Desire (1953), starring Barbara Stanwyck and directed by Douglas Sirk, used the home as a central location. Sirk was under contract at Universal and directed a number of genre defining films for the studio, a few of them shot on Colonial Street. 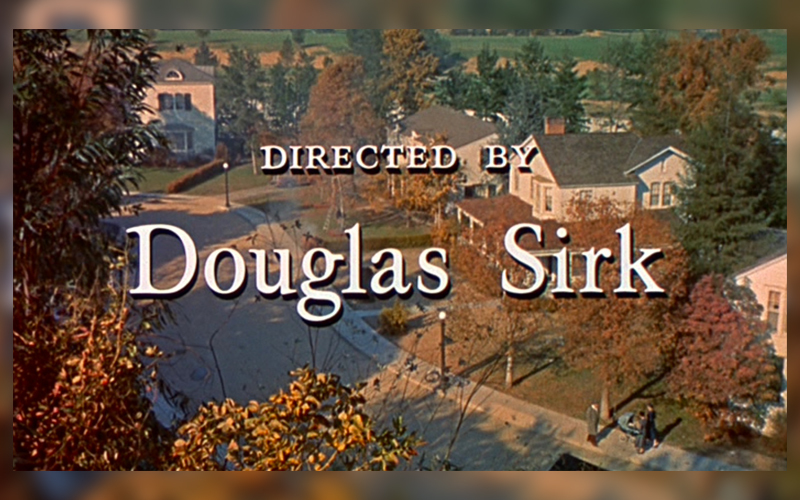 All about the secrets that one hides behind closed doors, All I Desire and Sirk’s masterpiece All That Heaven Allows (1956) examine the suburbs in a way that is in stark contrast to television’s early sitcoms. The home Jane Wyman occupies in All That Heaven Allows was constructed for The Desperate Hours (1955), a Paramount crime drama starring Humphrey Bogart. Eventually that house became one of the most watched homes in America. 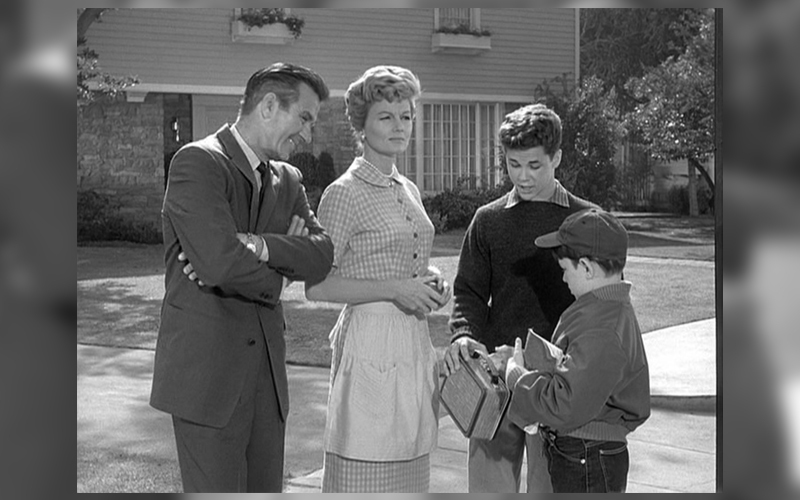 Leave It to Beaver hit the airwaves in 1957 and Cleavers were the show’s the saccharine-infused, middle class suburban family beaming into living rooms of the day. Revue Studios, the television production subsidiary of powerhouse talent agency MCA, headed by Lew Wasserman, produced Leave it to Beaver. The first two seasons of Beaver were filmed at Republic Studios, today CBS Studio Center on Radford Avenue in Studio City. There, the Cleavers lived at 485 Maple Dr. in the quaint suburb of Mayfield. In 1958, MCA bought Universal Studios, which had grown to over 400 acres. MCA relocated its shows from Republic Studios to the Universal lot and in 1959, at the beginning of season three, the Cleavers moved into 211 Pine Street on Colonial Street. Beaver’s friend Larry would also make the move. He lived in the House of the Seven Gables. Alfred Hitchock Presents, the director’s macabre anthology TV series, also moved to the Universal lot with the rest of the Revue productions. In fact, an episode called “Bang! You’re Dead” (1961) used the Cleaver residence. The gun-related episode is especially cringe worthy today. As the ‘60s progressed, the films of Douglas Sirk were given a comedic spin in rom-coms directed by Norman Jewison (In the Heat of the Night, Moonstruck). Both The Thrill of It All (1963) starring Doris Day and James Garner and Send Me No Flowers (1964) starring Day and Rock Hudson filmed on Colonial Street. You can also glimpse Colonial Street on episodes of Western series Wagon Train and cop shows like Dragnet 1967 and Adam-12. In 1969, six years after Leave It to Beaver left the air, Marcus Welby M.D. moved into the Cleaver residence. The Thrill of It All house was built for 1941’s Nice Girl? The disillusionment caused by the Vietnam War bled into the 1970s and suddenly the wholesomeness of suburbia represented everything wrong in American society. Other than a few TV series like The Hardy Boys/Nancy Drew Mysteries (1977-1979), The Rockford Files (1974-1980), the short-lived Shirley (1979-1980) and a TV movie with Orson Welles called It Happened One Christmas (1977), it appears that filming on Colonial Street had slowed. By the 1980s, a shift in American culture brought the focus back to ‘burbs. Bedtime for Bonzo actor Ronald Reagan was the President of the United States. In his famous 1984-reelection campaign “Morning in America” he touted that due to slashed interest rates more Americans were buying homes than under his predecessor, Jimmy Carter. The Baby Boom generation was having kids of their own and many returned to a sense of familiarity in suburbia. Filmmakers of the generation were also revisiting the suburbs. Steven Spielberg put it front and center in 1982 in E.T. the Extra-Terrestrial and Poltergeist. Dante, prior to directing The ‘Burbs, focused on small towns in Gremlins (1984) and Explorers (1985). 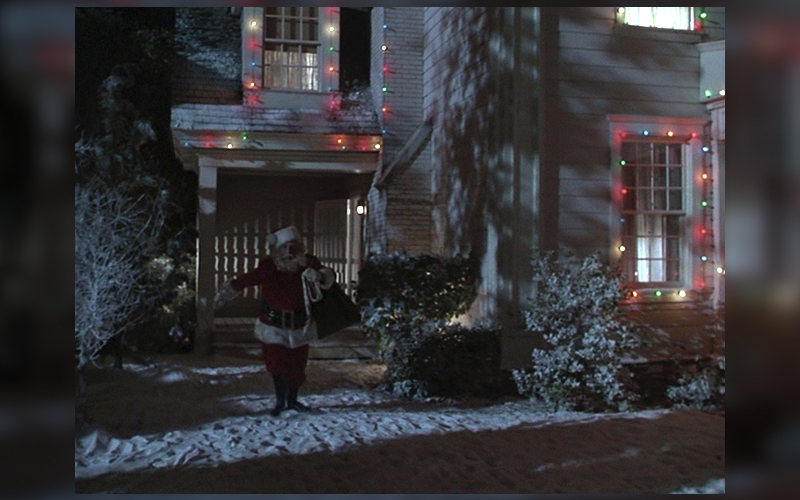 In an episode of Amazing Stories (1985-1987) – created and executive produced by Steven Spielberg – Santa leaves the house that became Tom Hanks’ home in The ‘Burbs. One of the first episodic television shows to provide a good glimpse at the 1980s Colonial Street was Simon & Simon (1981-1989). 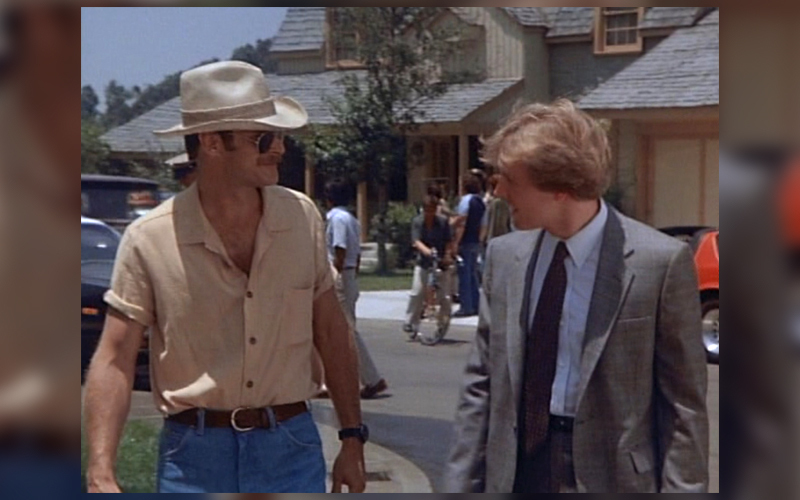 In an episode from 1982 called “Guessing Game,” the two San Diego-based, private investigator brothers assist a psychic who lives in a house originally built on Universal’s Falls Lake as Ron’s (Rock Hudson) barn for All That Heaven Allows. A Murder, She Wrote episode from 1985 called “Tough Guys Don’t Die” finds Jessica Fletcher (Angela Lansbury) visiting a private investigator’s widow at her suburban Boston home. The same house was previously the suburban New York home occupied by Doris Day in The Thrill of it All. 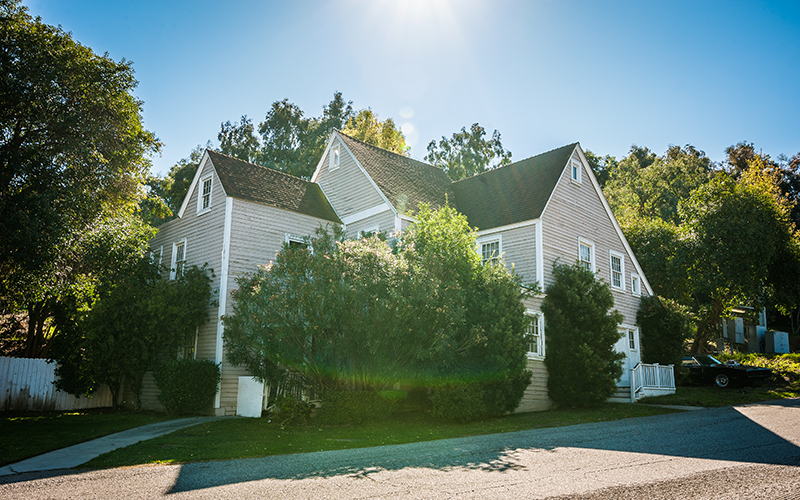 Murder, She Wrote also used nearby Jaws Lake for shots of the coastal Maine village of Cabot Cove. In 1983, a TV movie called Still the Beaver reunited most of the main cast of Leave it to Beaver. They returned to 211 Pine Street, which was also relocated to the new Colonial Street. The movie was a success and spawned a series called, aptly, The New Leave It to Beaver, which was produced by Universal Television. It aired on the Disney Channel from 1984-1985 and on TBS from 1986-1989. During this period, Andy Griffith moved in down the block from the Cleavers for Matlock. A 1988 episode of Matlock with Andy Griffith Show co-star Don Knotts is particularly amusing due to the actor’s relationships with Griffith and Colonial Street. In the episode, Knotts plays Ben Matlock’s new neighbor, Les Calhoun, who purchases a “lemon” DeLorean. Fans will automatically make the Back to the Future/Universal connection. 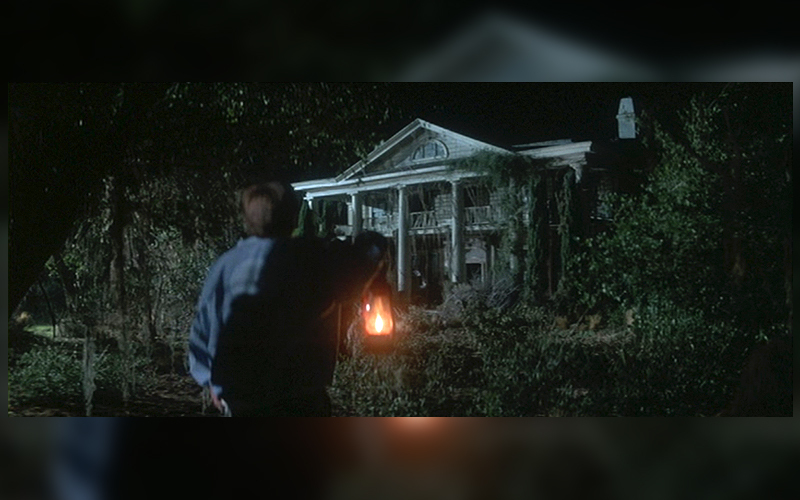 The 1987 cult film The Monster Squad shot at the Circle Drive storefronts as well as the Colonial Mansion, which became the “old house on Shadowbrook Road.” That same year Hanks filmed on the street when he appeared alongside Dan Aykroyd in the feature film version of Dragnet. As a result, The ‘Burbs harkened back to the Golden Age of Hollywood when an entire pictures were being shot on studio lots. Mayfield Place in The ‘Burbs. The Munsters house is visible on the left. 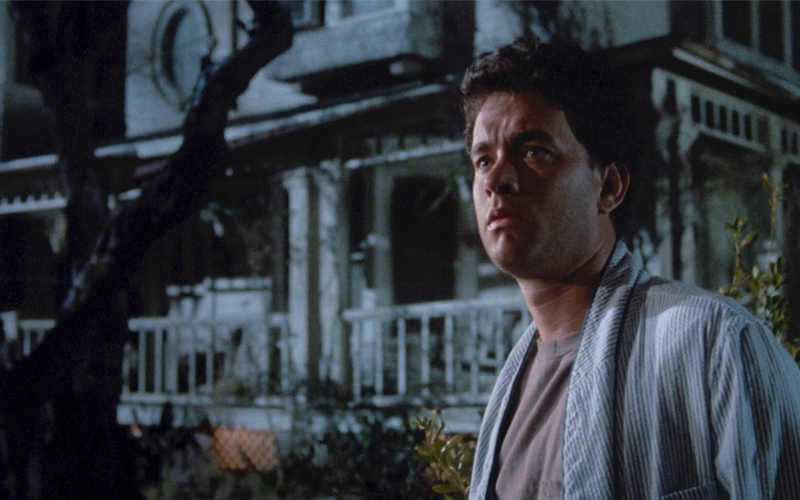 The ‘Burbs was shot during the six-month-long writers’ strike of 1988 and Universal was largely a ghost town. The only other film shooting on the lot was Fletch Lives (1989), the sequel to the 1985 hit comedy starring Chevy Chase. Throughout the ‘80s and ‘90s, filming on Colonial Street seems to have been on an uptick. When a St. Bernard puppy escapes the clutches of two evil henchmen (Stanley Tucci and Oliver Platt) in the opening of Beethoven (1992), they try to capture the runaway dog in the middle of Colonial Street. The location turned into the town of Friendship, Maine in Casper (1995) with Christina Ricci. In 1997, Hanks’ house from The ‘Burbs was replaced with a recreated Cleaver home for a glossy Leave it to Beaver feature film. One year later another iconic Universal property came to Colonial Street when Gus Van Sant’s remake of Psycho (1998) grabbed a couple of shots on the street. Deep Impact (1998) with Elijah Wood was shot there, too. Hanks returned to Colonial Street in 2004 for the Coen Brothers’ remake of The Ladykillers, which used the Harvey house as a central filming location. 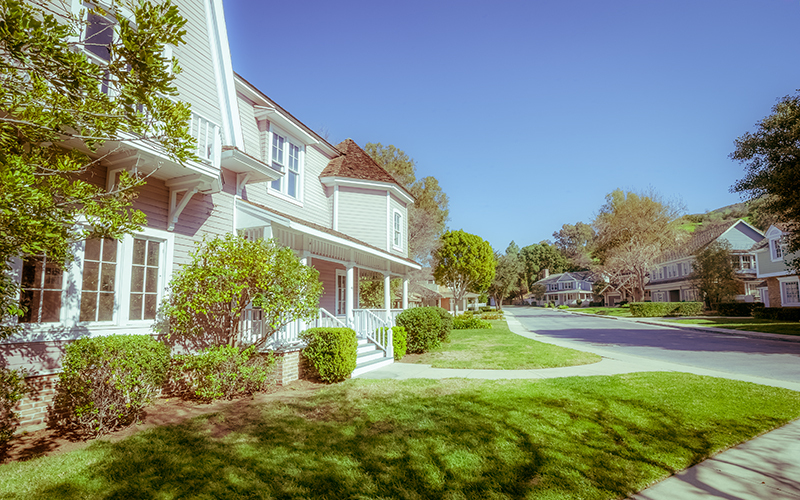 Though The ‘Burbs is a memorable milestone in the history of Colonial Street, no other production has used the location as much as the Earth-shatteringly popular ABC series, Desperate Housewives (2004-2012), which famously transformed the outdoor set into Wisteria Lane. The show contemporized and twisted the Technicolor world of closed-door secrets of the Douglas Sirk films shot on Colonial Street in the ‘50s. 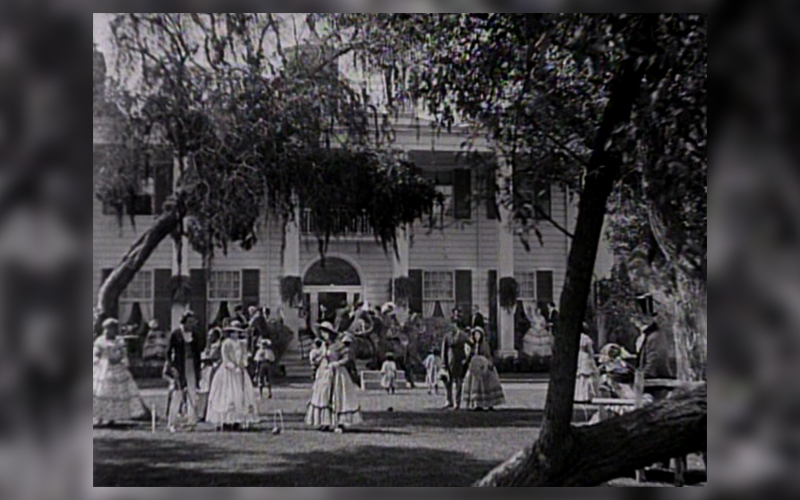 Just as Dante referred to the backlot at Universal as kind of odd, that perspective is exactly why Colonial Street was the perfect setting for Desperate Housewives. There’s a mystery behind each pastel exterior of every home on the street. 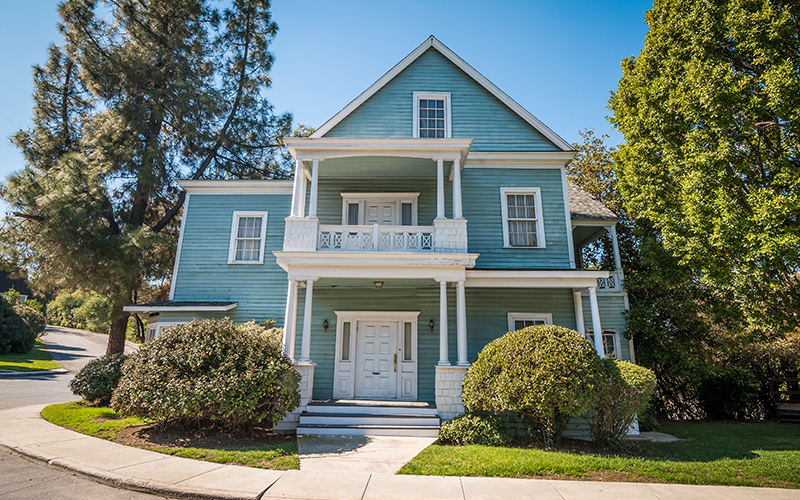 Two of Colonial Street’s original houses built in the mid-1940s, the Harvey house and The Munsters house, were used in Desperate Housewives. 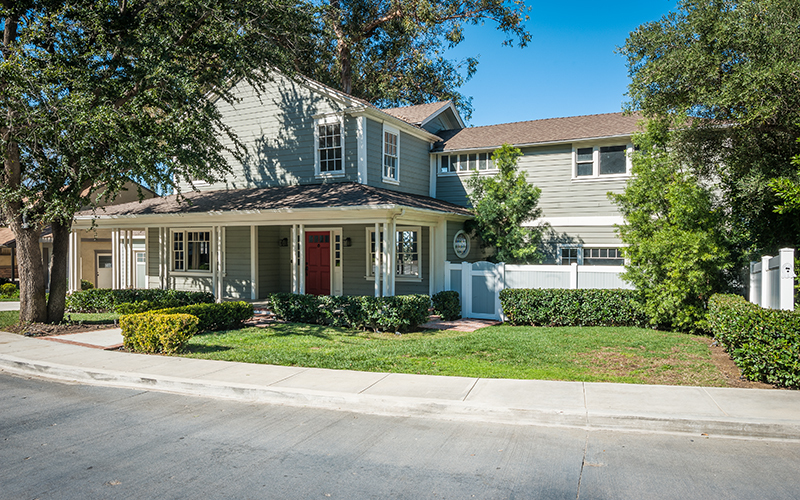 In another homage to the street, whether intentional or not, the Munsters’ home in Desperate Housewives also has a “dungeon.” Newer homes built for The ‘Burbs and the Leave It to Beaver film were also given the pastel Wisteria Lane treatment. The Colonial Mansion, the original set of Colonial Street, along with the church and storefronts were removed for the series. 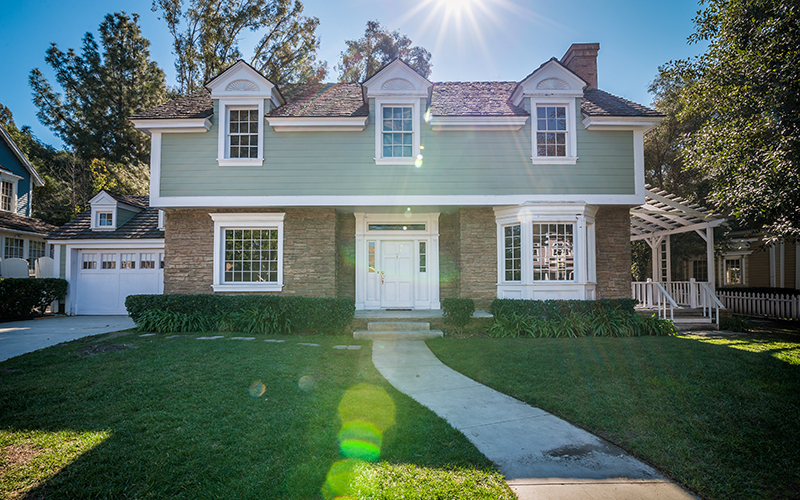 Subsequent to Desperate Housewives, NBC’s About a Boy (2014-2015) used multiple houses on Colonial Street, which was adjacent to the show’s main location: a renovated Chicken Ranch. Why Him? (2016) starring Bryan Cranston and James Franco completely winterized the set and landed a helicopter on the street. Commercials are also commonly shot there. Today, the asphalt running down the middle of Colonial acts as a timeline connecting the 15 houses that adorn the street. Not only do they represent Universal Studios history; they are symbolic of the generations in which they were built. 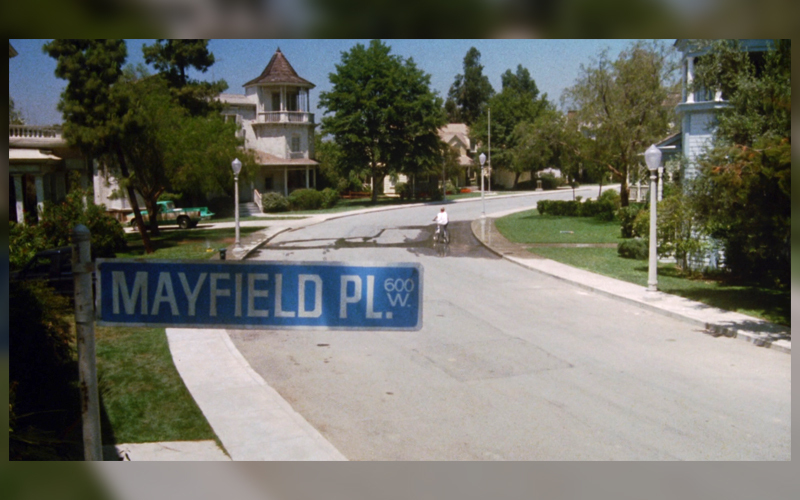 Colonial Street is largely unchanged from how it appeared in Desperate Housewives and until another beloved series takes over the street for nine years, Colonial Street will most commonly be known as Wisteria Lane. However, for me it will always remain Hinkley Hills where Tom Hanks blew up a house and saved his neighborhood from a familial trio of murderers. In the closing words of Mayfield Place’s Ricky Butler: God I love this street. Follow Jared on Twitter at @JaredCowan1.